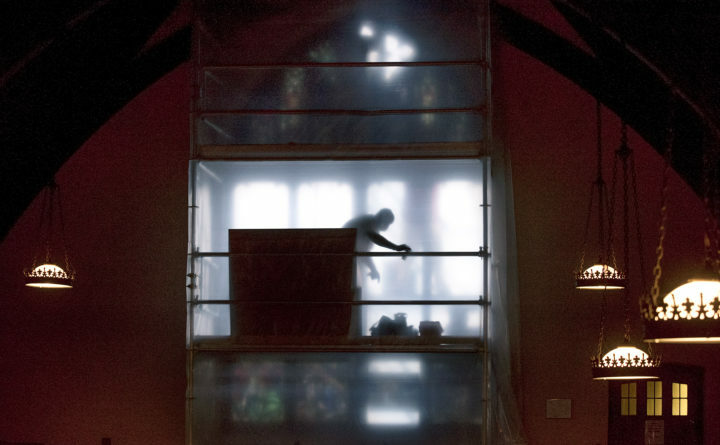 A worker is silhouetted against a partially removed stained-glass window at All Souls Church in Bangor on Monday. A crew from the Hampden, Massachusets-based Stained Glass Resources Inc. is removing two major windows from the church. After cleaning and repairs, crews will reinstall them in the spring. The roads aren’t the only thing undergoing a transformation at the intersection of State Street and Broadway in Bangor. For the past two weeks, crews have been removing two of the most prominent stained-glass windows at All Souls Congregational Church, pane by pane. 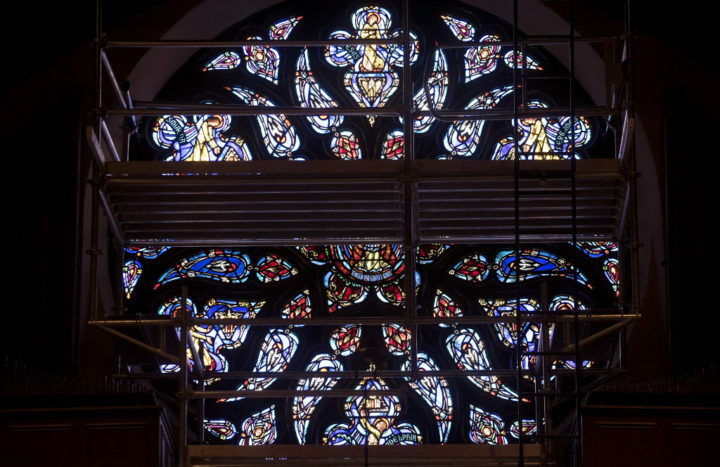 It’s part of a $180,000 project the church has undertaken to preserve two of its highest windows after decades of wear. The Rose and the Archangel windows, designed by artist Charles J. Connick, contain myriad colors and are inspired by traditional stained-glass work at European cathedrals. The Archangel Window, installed in 1913, the same year the church was built, depicts the archangels Michael, Raphael, Gabriel and Uriel, and is located on the side of the church facing State Street hill. The Rose Window, designed in 1939, is located in the organ loft at the front of the church facing Broadway, and it represents the seven churches of Asia Minor (modern-day Turkey) referenced in St. John’s Book of Revelation in the New Testament. Removing decades-old, stained-glass windows is no simple task. Workers from the Hampden, Massachusetts-based Stained Glass Resources Inc. set up scaffolding to access the windows on Oct. 11, and then started removing individual panes on Monday. The workers photographed, labeled and cataloged each section of window before packing them up for the journey south to Massachusetts. They’ve placed plywood in place of the windows until crews reinstall them in the spring. 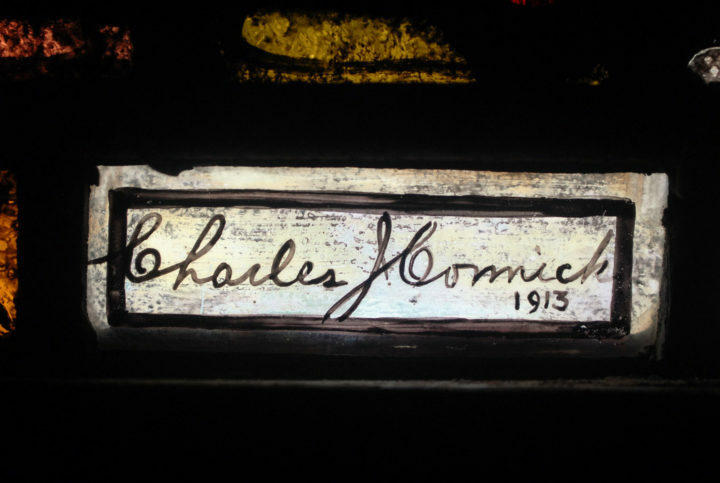 Stained glass signed by Charles Connick, a prominent American painter well known for his stained glass in the Gothic Revival style, is throughout All Souls Congregational Church. Once at the Stained Glass Resources facility, crews will remove lead from the many parts of the windows and clean, repair or replace parts before reassembly. Plans to preserve the windows have been years in the making. Crews removed, repaired and cleaned the Chancel Window, located above the altar, in 2004. The church developed a time frame to eventually repair all 26 windows in the church, and the Rose and Archangel windows were next in line due to their condition. Key to preservation of the windows is deciding to take action before the windows require replacement altogether. That, according to Poland, would be a much more expensive task. In order to preserve the original windows, parishioner Ellen Hall inspects them regularly for a number of different problems, including bowing, cracking and separation of the glass from the frame. “We’re trying to be proactive,” Hall said. Although necessary, the window removal requires a little bit of flexibility on the congregation’s part. Since crews placed scaffolding inside the church, a small group of volunteers had to remove 30 pipes from the organ. Poland said that the organ is still playable, and the choir will continue to sing in the loft until the restoration is complete. Despite the work zone appearance, parishioners are grateful for the steps the church has taken to maintain these pieces of art. To cover the $180,000 required for the project, the church will use funds it has set aside specifically for the windows’ preservation. Those funds will cover a third of the cost, Poland said. The church plans to finance the remainder, but it’s also accepting donations through its website. After this latest project, the smaller windows lining the first floor of the building are next in line once the budget allows. The windows’ preservation is important not only for the church, but also the city, Poland said. It will ensure a historic piece of art remains intact for another generation.